A teacher once wrote telling me that a parent with a great deal of clout at her school asked her to change attendance records to make her child’s record look better. The teacher said she thought long and hard about the request but eventually refused, knowing it would make the parent angry. I commended her moral courage. I wish it didn’t take courage to do the right thing, especially in such a clear case as this, but in the real world people with power often retaliate when they don’t get what they want. This can make our lives difficult. Still, moral courage is the much-needed bodyguard ofconscience and character. 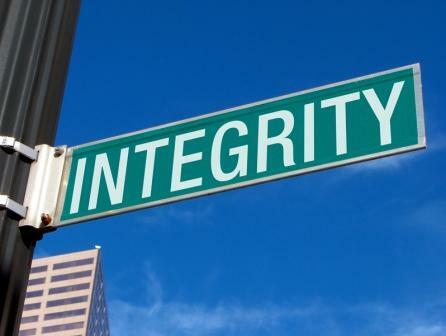 The personal costs of putting our integrity on the auction block are so high that we have to take the risk. Once we descend the slippery slope of moral compromise, it’s hard to resist the inevitable slide. My first instinct was to think of the parent who subjected the teacher to this corrupt and corrupting request as a villain, but I suspected she was a basically decent mom so intent on helping her child that she ignored her moral brakes. But it’s wrong to ask someone to lie or cheat. When it comes from someone with power, it’s worse. Power is intimidating even when it’s not used. But unswerving integrity can also be intimidating. Improper requests deserve an immediate, firm, and dignified response that leaves no ambiguity that they’re inappropriate. Be careful not to be self-righteous, though. Let the person worry about what you think of them. If they persist, let them – not you – worry about the consequences. Some of the best advice you you’ve ever given, Michael. When I give a response to an improper request, I call it “opening my mouth and letting my grandma come out.” She was a good woman who stood her ground! In the field of public education it is more than likely to “cost one his/her job” for taking a moral ground stance. I know, it happened to me. There are too many ways that a Principal can intimidate others to back-up his/her actions vs. the lonely teacher. If it were ever possible to somehow eradicate the mis-use of power in the system it would be a giant step towards having the needs of students become the top priority. Right now, especially when new, a person in power has a different agenda” namely, insuring that their job is in tact. Their first step is to gain control over the custodial, office assistants . and teachers. Once that power is established, gaining co-operation and backing of “selet” parents in the Commnity is upper most. Should any personnel take a stance that is viwed as “jeopardizing” this goal, it will be swiftly and covertly obliterated.